What a bright warm Sunday. We had an excellent number of members and guests in attendance this Sunday. Early arrivals this Sunday are Nellie Ruiz TONKAWA Vice President Jerry Starnes and Roy Cook. Nellie rode with her son. Jean brought Rollie and her Mother, Genevieve. Rose Davis brought the latest copy of Indian Voices for the members to enjoy. Jerry Starnes, enrolled Menominee Tribe, chaired the meeting. TONKAWA President Violet Tunotun will step down while she deals with personal issues but she will continue to seek out financial support for the TONKAWA senior club. Jean Vineault, TONKAWA treasurer, reported on the progress and complications of securing separate financial services. We will continue to be patient with the process. It is nice to share company with more members this sunny Sunday. 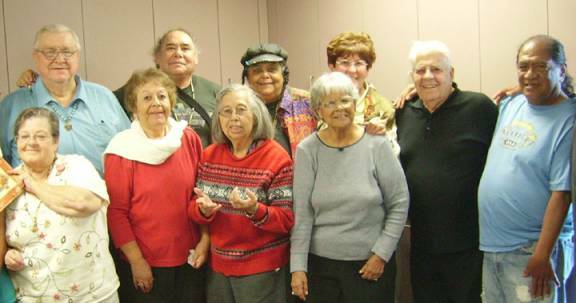 It always feels so good to be alive and in the company of our respected American Indian TONKAWA Elders. The attending members and the tables looked fine and we sat down to a heartfelt healthy potluck feast with good TONKAWA hot coffee. No butts about it this luncheon is excellent! Verna Antonio provided the luncheon blessing at 12:10. 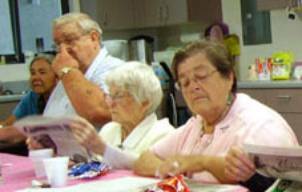 There is always a warm fellowship; we are so fortunate to have years and years of living and wisdom close at hand. Today we had choices of Enchiladas, special chicken and sweet potato posole, a selection of cheeses, side dishes. Bread and butter and for all to enjoy red or white grapes, berry pie or cookies with good hot TONKAWA coffee lubricated the conversation. We cleaned up, packed up and while some TONKAWA members were still packing take-home snacks, drinking coffee, talking and laughing, others went out the door by 1:45 pm. The next TONKAWA meeting is March 14, 2010.